Renowned for outstanding coffee and as home of Sachertorte, Vienna, the capital of Austria, has lots for lovers of history. Duncan JD Smith, a British travel writer, is based in the Austrian capital. He’s the sole author and publisher of the ‘Only In’ Guides series of guidebooks, which celebrate the unique and the hidden in Europe’s cities. So who could be better placed to answer our questions and let loose a few of Vienna’s secrets? Why do you think people should come and see Vienna? Vienna offers a unique combination of attractions that reflect its longstanding position at the heart of Central Europe. A 19th century boulevard of impossibly-grand buildings – the Ringstrasse – girdles the labyrinthine medieval heart of the city. A world class legacy of classical music is played out against a fairytale backdrop of period concert venues. A tangible history stretching back to the Romans encompasses the Habsburg monarchy, the Ottoman Turks, fin de siècle achievers such as Freud and Klimt, and monuments recalling the horrors of the Second World War. Fringed by vineyards and the Vienna Woods, all this can be discovered just 30 minutes from the city’s international airport. What is your favourite place in the town and why? After 13 years in Vienna, I never tire of visiting the Mölker-Bastei at Schottentor, which encapsulates much of Vienna’s history in a surprisingly small area. The place initially struck me as odd because it is a little hill in an otherwise flat part of town. Delving into the history books revealed that it is one of the last remaining pieces of the old city wall, torn down in the 1850s to make way for the Ringstrasse. Why this piece was left standing is a mystery but I like to think it was to spare the house built on top of it in which Beethoven wrote his only opera Fidelio. Orson Welles loitered in one of the doorways in his memorable first appearance in the film The Third Man and it was also hereabouts that the penultimate emperor, Franz Joseph I, was saved from an assassin’s knife by his Irish man-at-arms. Where the wall drops down inside the city is a traditional clothing shop called Tostmann. Their secretive cellars were originally used to store wine and later pressed into service as an air raid shelter during the Second World War. The Mölker Bastei with the Ringstrasse. The quirkiest place to dine must be Schloss Concordia opposite Vienna’s Central Cemetery on Simmeringer Hauptstrasse. The vast cemetery requires three tram stops to service it, so be sure to get off at Gate 1, opposite the entrance to the abandoned Old Jewish Cemetery. The restaurant, which is surrounded by trees heavy with mistletoe, is housed in what was once a monumental mason’s studio, and takes the form of a wooden pavilion crowned by a stained glass cupola. The candlelit interior is modest, with worn floorboards and rickety chairs. The menu is idiosyncratic, too, featuring variants on Austrian classics. Highly recommended is the Super Schnitzel, which is filled with lentils and then rolled and coated in cornflakes. It is served on a silver platter surrounded by exotic fruits and vegetables. Duncan JD Smith tucks into a Super Schnitzel at Schloss Concordia. A pair of Viennese drinking institutions lie so close to each other that I can’t resist mentioning them both. The American Bar on Kärntner Durchgang is an Art Deco gem designed in the early 1900s by the Modernist architect, Adolf Loos, after a visit to the USA. The best gin and tonic in town can be enjoyed here at cosy green leather banquettes beneath a marble coffered ceiling. A couple of streets away on Stallburggasse is Café Bräunerhof. This traditional Viennese coffeehouse has scarcely changed in a century and is the place to come for a Wiener Melange (espresso with milk and foam) and a slice of Apfelstrudel. A good selection of international newspapers is available and on Saturday afternoons a quartet belts out Schrammelmusik (Viennese folk music). What is your favourite legend or quirky bit of history associated with your town? My favourite Viennese legend concerns Blutgasse, a cobbled alley concealed behind St Stephen’s Cathedral. Those entering the doorway at Number 8 will pass through a five-storey lightwell and a narrow passage to enter a surprisingly peaceful courtyard dominated by a plane tree. According to legend a medieval knight’s sword is hidden deep in its heart. Since the tree is not old enough this can’t be true – but like all good legends there is some truth here. In the 13th century the area was home to the Teutonic Knights, an organisation akin to the Knights Templar, sworn to protecting pilgrims on their way to the Holy Land. When the order was suppressed in 1312, the street outside ran with blood giving rise to its name: Blutgasse (Blood Alley). Fast forward now to the 18th century and the plane tree is a sapling, protected from horses by iron railings. As it grows so the railings break and a fragment becomes embedded in the trunk. Children who have been told about the knights believe that the iron fragment is one of their swords. A legend is born! 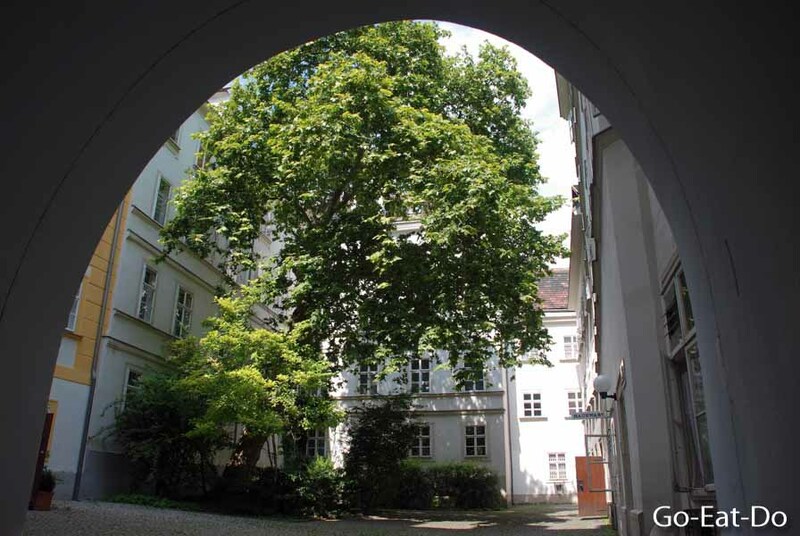 The tree in the courtyard off the Blugasse in Vienna. Most visitors would probably try to bolt on another city, such as Bratislava or even Budapest. My recommendation, however, would be to spend a little time in Vienna’s suburbs. After all, that’s where the real Viennese live rather than in the culture-rich city centre. The 19th District of Döbling, a well-to-do neighbourhood barely 20 minutes out of town, is a case in point. Jump off tram 37 at Barawitzkagasse to visit the wholly unexpected Setagayapark. This Japanese garden is glorious in spring, when the cherry blossom is out, and reflects the fact that Döbling is twinned with the Tokyo district of Setagaya. Walk uphill to take tram 38 to the wine village of Grinzing or walk downhill to find the Karl Marx-Hof, a monument to the city’s Socialist housing schemes of the 1920s, and the world’s longest residential building. Duncan JD Smith‘s book Only in Vienna is currently in its 5th edition. It was the first of his ‘Only In’ Guides, and details more than a hundred unusual locations, including Klimt’s last studio, the Fool’s Tower, the Cemetery of the Nameless, and 007 in Vienna. Only in Edinburgh will be published in November 2016. Look elsewhere on Go-Eat-Do and you’ll be able to read a review of Duncan’s Only in London. The photos illustrating this post were supplied by Duncan, who owns the copyright to them, and must not be reproduced without his permission. The Vienna and Austria tourist information websites also have a wealth of ideas of things to do and see in and around the city. Duncan’s books are little gems of information and always accompany me when I visit European cities. I enjoyed his book about London when I visited the city earlier this year. I’m looking forward to reading your new book on Edinburgh, Duncan. I’ve been to the city many times but, no doubt, you’ll have found some spots well away from the beaten trail and interesting aspects of well-known places. We like to recommend the very best. A wurst or two is good in German-speaking nations.